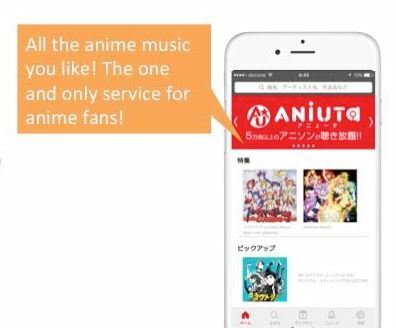 After what seems like forever, the anime music industry has gotten their heads together and have finally come up with an anime music streaming service with over 50,000 tracks. The service, called ANiUTa, features a collaboration between the record labels FlyingDog, Inc., avex pictures inc., Frontier Works Inc., Kadokawa Corporation, Lantis Co., Ltd, Marvelous Inc., PONY CANYON INC., SUNRISE Music Publishing Co., Ltd., TOEI ANIMATION MUSIC PUBLISHING CO., LTD., and TOHO CO., LTD, covering a major chunk of the anime music publishing industry. Anime that will prominently be featured on streaming service includes hits like Attack on Titan, Free!, Genesis of Aquarion, Girls und Panzer, K-On!, Kantai Collection, Love Live!, Lucky Star, Macross Frontier, The Melancholy of Haruhi Suzumiya, Wake Up, Girls!, and Yuri!!! on ICE. On top of anime music, their lineup also includes music from games, superhero productions, and even Vocaloid. The reason why I say this is a long time coming is because, aside from a few pieces of anime music and songs scattered over on Spotify, it’s pretty hard to find that stuff online. YouTube is decent for that, but if you’re looking for any OP/ED theme, you’re more likely than not to hit upon some horrible Nightcore version of the same song or a slightly sped up version to evade the content ID filters. You can also try going on some online anime music radio station to get your fix, but having a service with music on demand is better if you’re picky and like to curate your own playlists like I do. The service does come with a price tag. Right now, the monthly subscription cost comes out to about 600 yen ($5USD). Paid users will have access to all tracks and special perks like pre-sale concert tickets and and exclusive items. If you’re a free user, you’d be able to search their catalog and listen to samples. So far, it’s only available in Japan, but the plan is to roll it out worldwide within a year.